One important fact to remember about that the Nazis is that they were originally democratically elected into office. 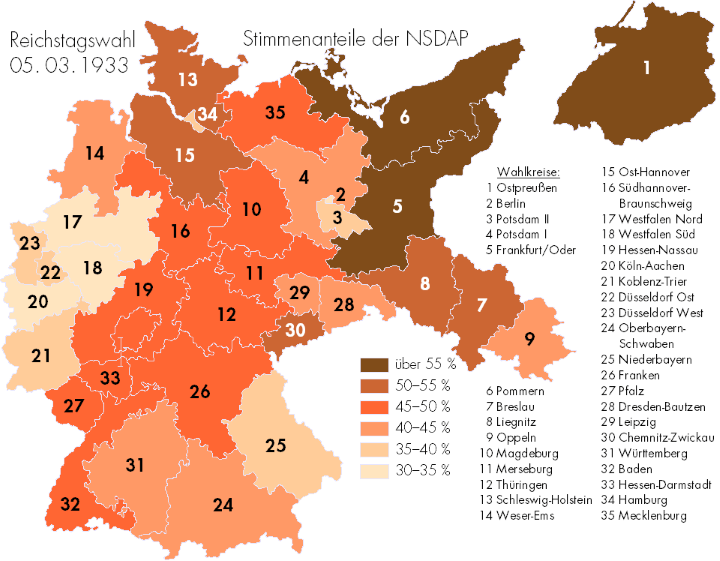 The map above shows where National Socialist German Workers Party (Nazi) support was the highest in the election of March 3rd, 1933. It would turn out to be the last somewhat “free,” multi-party German election held across all of Germany until December 2nd, 1990, after German reunification. However, it’s also important to note that while the Nazis won the most seats in 1933, they did not win a majority of them or the popular vote. Support varied widely across the country. It was highest in the former Prussian territories in the north-east of Germany (with the exception of Berlin) and much weaker in the west and south of the country, which had, up until 1871, been independent German states. Across Germany as a whole, the Nazis won 43.91% of the popular vote and got 44.51% of the seats. This made them by far the largest party in the German Reichstag, but still without a clear majority mandate. And this was after the Communists and Social Democrats were intimidated and attacked by SA brownshirts throughout the election. After Hitler’s failed Beer Hall Putch, in November 1923, the Nazis charged tactics and began to focus on electoral success rather than trying to take power in a coup. The party first entered the Reichstag in the May the following year, winning 6.5% of the popular vote, but coming in 6th place overall. The party would continue to remain on the fringes of German politics throughout the 1920’s, with support dropping to just 2.6% in 1928. However, the onset of the Great Depression massively rived Hitler’s fortunes with the Nazis winning 18.25% in September 1930, becoming the second largest party in Germany. This was then followed by the July 1932 election where Hitler and the Nazis finally become the largest party in the Reichstag, with 37.3% of the vote. This would be the first of three electoral “victories” for Hitler. However, without a majority and with a strong showing from the Communists, he could not form a government but neither could the parties that supported the Weimar Republic. The stage was set for round two. In November 1932, fresh elections were held across Germany with the Nazis remaining the biggest party, but with 2 million fewer votes than in July, dropping their share of the vote to 33.1%. While it was a blow to Nazi support, Hitler was invited by Reich President Paul von Hindenburg with support from former Chancellor Franz von Papen to become Chancellor of Germany on January 30th, 1933 (von Papen was made Vice-Chancellor). Following, the election results Hitler decide he was done with electoral politics. He managed to get support from the right-wing DNVP and the Catholic Centre Party (in return for sporting the Reichskonkordat) while blocking some Social Democrats from the Reichstag to win a 2/3rd majority needed to pass the Enabling Act. Thus giving him dictatorial powers (although supposedly having to be renewed every 4 years). Therefore, while clearly not all, or even a majority of Germans voted for Hitler, enough did that he was given the opportunity to seize power. Interestingly, many of the areas that had the strongest support for him are now no longer part of Germany, but were ceded to Poland and the Soviet Union. Also Berlin, which would become Hitler’s capital, had among the lowest level of support for the Nazis. For a look at what might have happened had Hitler won, have a look at What If Nazi Germany Won World War II? Fictional & Historical Scenarios. It’s probably fairer to call the November 1932 elections the last free ones – there were police and SA in polling booths for this one. I know you allude to intimidation, but for this election the Reichstag Fire Decree was already in force.